Please add me on facebook in order to chat or upload your chart so I can check it out. I’m Libra Venus rising remember so it makes me far too lazy to type in your birth details to erect your chart for you. I’m keen on getting to know the people who check out my Night Sky site, and maybe we can even become friends. I’ve made good friends through astrology already and may that continue. May you find what you are looking for and receive the answers. Here is the chart for the moment that this page was created. Moon is debatably combust though I am in favour of it not being combust thanks to being out of sign. All the same she applies to Sun by conjunction. Mars in the tenth is prominent in fall yet in triplicity not so bad. I might need to control my anger more. Keep that in check. Certainly it will be kept in check since Saturn rises direct in exaltation. I might come across as mean and miserable, however, it should prove fruitful with a bit of patience. 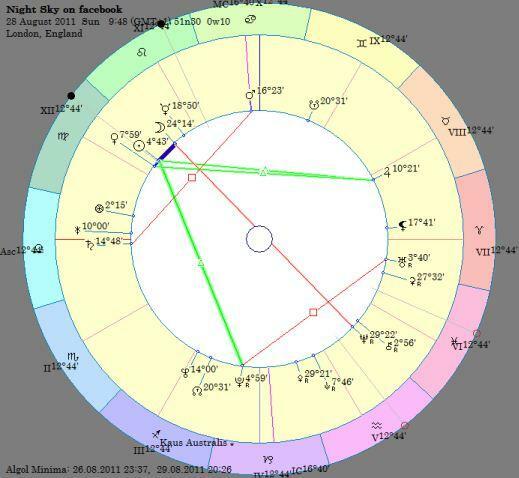 The most important thing to note about this chart is the 11th house stellium. I want friends and maybe I’ll have them with this little web page. Though we might also note that Venus ASC lord is fairly close to the cusp of the 12th, meaning I’ll probably want to keep myself hidden all the same. And true it is, I haven’t revealed my name or my birth chart on this page, and there are no personal details as such on there. Venus applies to Jupiter with reception so the outcome should be positive overall. I’m happy with it. Please join and make me not look like a loner.